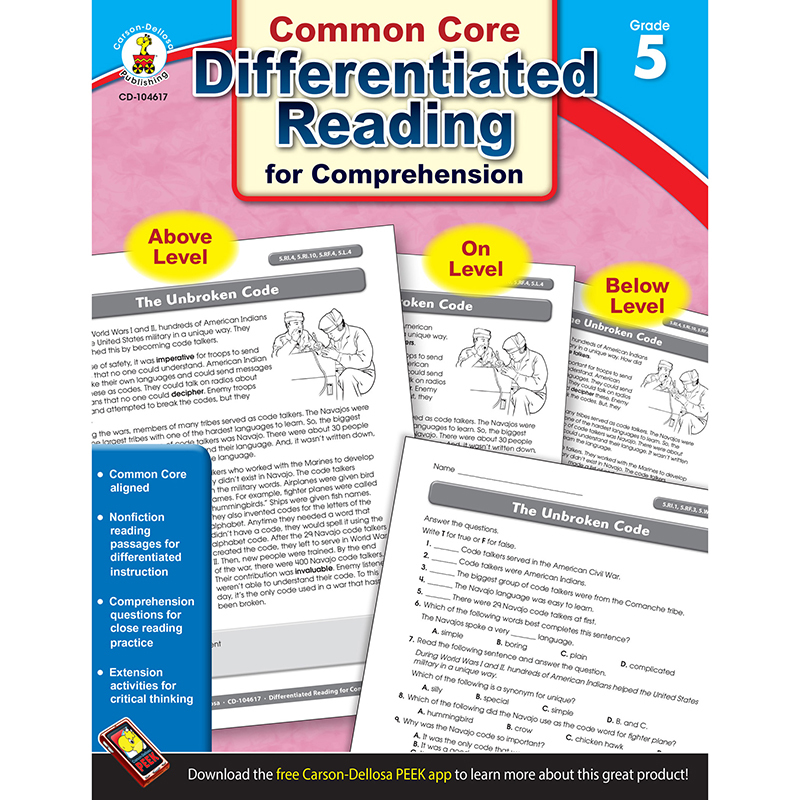 Differentiated Reading for Comprehension is designed to provide high-interest, nonfiction reading success for all readers. This 64-page book focuses on fifth grade reading skills defined by the Common Core State Standards. Each of 15 stories is presented separately for the below-level, on-level, and advanced students, followed by a series of comprehension questions. Grade five covers such standards as quoting a text to explain an answer or draw inferences, identifying and explaining an author's reasons and evidence, and analyzing the structure of a text. This new series will allow teachers to present the same content to below-level, on-level, and advanced students with these leveled nonfiction stories. It includes multiple-choice, fill-in-the-blank, and true/false questions; short-answer writing practice; and comprehension questions. Students stay interested, build confidence, and discover that reading can be fun! The reading passages will be separated into sections with titles such as Extreme Places, Amazing People, Wild Animals, Strange and Unexplained, Fascinating Machines, and Amazing Kids.